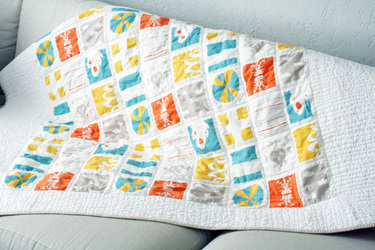 This quilt is made with fabric I designed over at Spoonflower. I was thinking forever about what to design. I wanted to take advantage of this digital printing process by using several colors and designing a pattern with a large repeat in a pretty large quantity, because that would have been a drag to try and silkscreen in my basement with 3 kids screaming at me. I decided to design a cheater cloth, partly because they are so cool, and partly because it meant a quilt in a flash, which is better for my lack of sewing/craft time right now. I love the idea of cheaters and wanted to design a modern one. It's quilted around the squares, to make it seem like patchwork. In a quick search, I found that cheater cloth started to appear as early as the 1850s. It was printed to look like a patchwork pattern or applique—all it needed was to be quilted, not pieced, hence the "cheater" name. I love Denise Schmidt's modern cheater cloths here at Cia's. It's simple and minimal and I am very, very pleased. This is 2 yards of Spoonflower fabric with added borders on the top, bottom and sides—making a generous sofa quilt. Grammie, my quilting rock star mom, put this on her gammill and quilted it for me, reminding me again I am the luckiest daughter in the world. It's been washed twice and I am really curious how the colors will hold up. I suspect some fading, but we shall see. Unrelated, I now have a search feature on my blog! I have received more than a few requests for this feature, because my categories are a bit spotty (understatement) So, if you are looking for gingerbread, that post about plastics, or something else you think I wrote about over the last 3.5 years, you can search for it easily in that box over there to the right. Also, don't forget to read the comments in the posts—I have the best commenter's ever and there's a ton of amazing info and links in there.